Kona represent extraordinary value with exceptional build-quality, playability, and tone. Featuring a hardwood fingerboard with smooth accurately positioned frets, nickel-plated guitar-style machine heads that turn smoothly and hold pitch more securely, and a hardwood bridge. Kona select top grade materials and carry out strict inspections at every stage of production using in-house quality control methods. 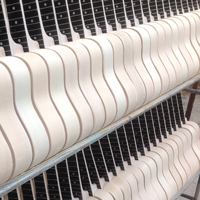 All Kona necks and joints are doweled and glued under pressure to ensure rigidity. 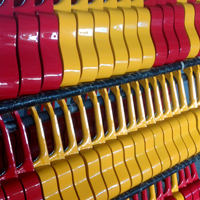 The high quality finishes are achieved under clean and controlled conditions. After all this care and attention Kona give a final quality inspection before packaging. Our basic Soprano range features 11 different coloured instruments made from Linden Plywood with a Maple bridge, open Geared Machineheads, and Gloss finish. 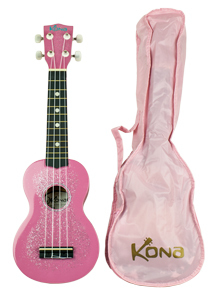 Our Soprano Ukuleles also come in Black with Sparkle finish and Pink with Sparkle finish as well as Palm Tree printed motif. A Soprano Ukulele made from Linden Plywood with Natural Top and Binding, Maple Bridge, Open Geared Machine heads and a Gloss Finish. 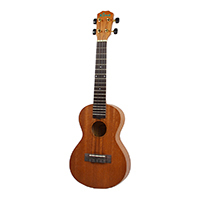 A Soprano Ukulele made from Mahogany Plywood with Mahogany Neck, Rosewood Fingerboard and Bridge, Open geared machine heads with an Open Pore Finish. A Concert Ukulele made from Mahogany Plywood with Rosewood Fingerboard and Bridge, Open Geared machine heads with an Open Pore Finish. 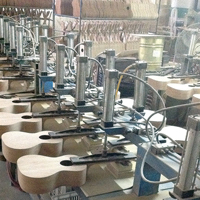 A Concert Ukulele with Spruce Plywood Top, Mahogany Plywood back, sides, neck, Rosewood Fingerboard and Bridge, Die-Cast machine heads with Open Pore Finish. 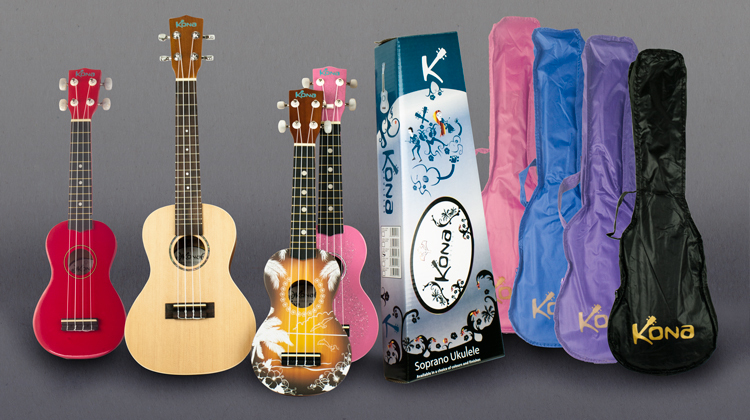 In a sea of affordably priced ukuleles on the market today, Kona represent extraordinary value with two ranges of ukulele - one for the beginner and one for the more serious, professional player. The Soprano(21) range is aimed at beginners, with 11 uniquely coloured easy to play models. Each one is manufactured from Linden Plywood with a Maple bridge, open geared machine heads and a gloss finish. Each instrument is carefully designed with exceptional build-quality, playability and tone while still remaining affordable. 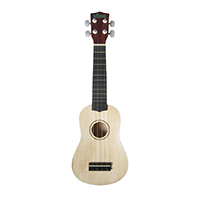 Key features such as a hardwood fingerboard with smooth accurately positioned frets, nickel-plated guitar-style machine heads that turn smoothly and hold pitch more securely, and a hardwood bridge truly make these ukuleles fantastic value in a competitive market. Kona select top grade materials and carry out strict inspections at every stage of production using in-house quality control methods. All Kona necks and joints are dowelled and glued under pressure to ensure rigidity. The high quality finishes are achieved under clean and controlled conditions and even after all this care and attention Kona give a final quality inspection before packaging. Kona also listen to every comment/suggestion from customers and continue to make improvements where necessary. 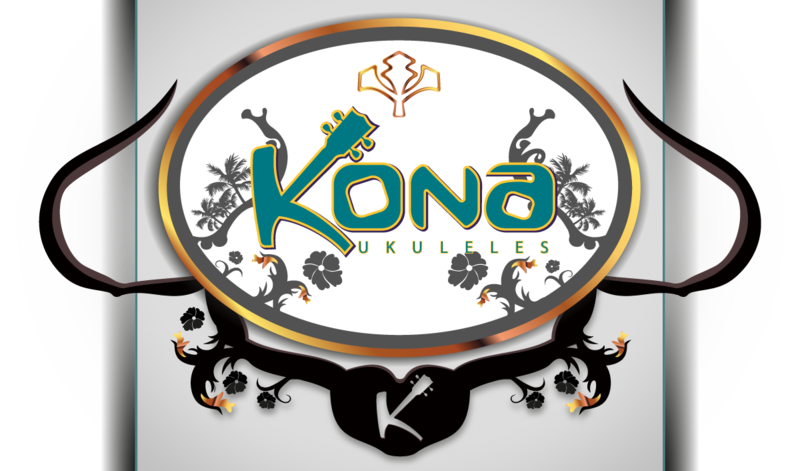 Kona are passionate about ukuleles and think it is important that a beginners ukulele is easy to play and thus gives them encouragement to continue. 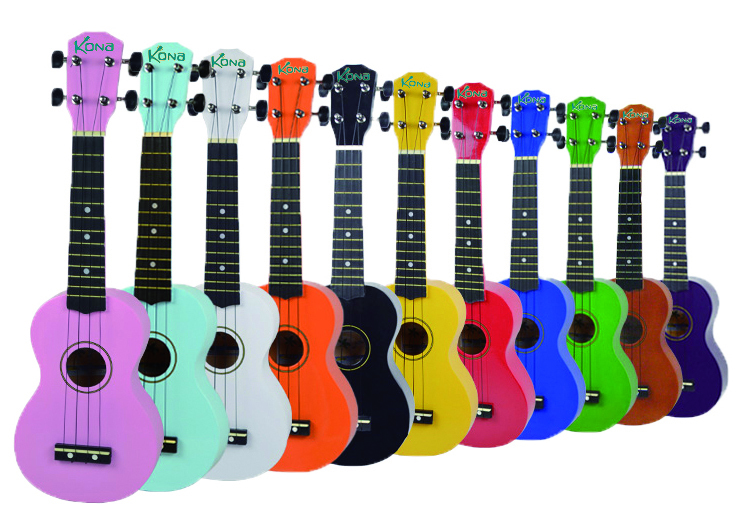 Kona 21’s come in a choice of 11 bright colours, and each Kona ukulele comes with a colour-matched carrying bag. 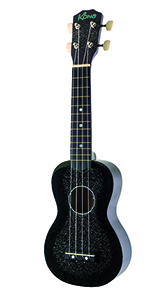 The more expensive, decorative models in the beginners range feature a unique sparkle effect finish and a palm tree motif. The Concert (23) series are made from either a mahogany or spruce ply, with a rosewood fingerboard and bridge and die-cast machine heads. The ukulele was invented in Hawaii by Portuguese Immigrant wordsmiths and the instrument was given popularity and appreciation by King Kalākaua, the last King of Hawaii who is a celebrated leader who brought back surfing and Lua and removed the ban on hula dancing in the 1800s. The popularity of the ukulele spread to the USA where it was widely used in Jazz and Vaudeville. The instrument spread into popular music and pop culture but in the 1990s the ukulele returned to popularity and has regular place online. The Soprano ukulele is the smaller of the two and is known for it's thin jangly sound for which the ukulele is known. 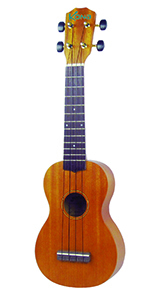 The Soprano Ukulele is 21 inches long with a 13 inch scale length. The scale length is the amount of the string that can vibrate to create a note and a Soprano having a short one gives it that distinctive sound. 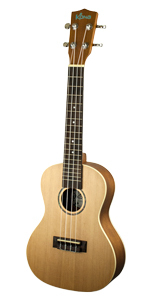 The Concert ukulele, also known as an alto ukulele is two inches longer and has a 15 inch scale length. This extra length gives more depth and sustain to the notes, and gives a fuller sound to your playing. The concert ukulele still sounds distinctifully like a ukulele but with added volume and warmth. Learn how to play ukuleles then you will learn how to fly. 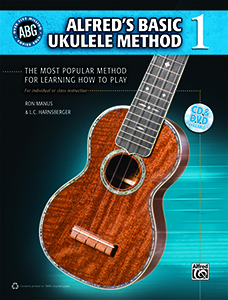 Kona Ukuleles recomends these books for beginning to play this instrument.